Romantic wedding-guest dresses. Add some sparkle and you're all set. Cocktail Party, Wedding, a Night Out to remember—whatever the occasion, we have the dress. Blush-colored dresses with romantic details are perfect for celebrating romance. A contemporary halter neck with cutaway shoulders updates the mermaid silhouette of this curvaceous midi dress. Light and dreamy chiffon flutters beautifully from the neckline down to the hem of a sweet wrap maxi with soft, cascading ruffles. Experience the glamour of crushed velvet in this elegant gown, styled with luminous, eye-catching beads, a sleek strappy back and long, leg-revealing skirt. Sheer mesh is softly gathered to a V-back neckline for a vintage-inspired start to a lithe crepe sheath streamlined by pronounced vertical seams. A gently pleated, one-shoulder neckline gives way to a bold, geometric cutout at the back of a stately, figure-skimming gown cut from sleek stretch crepe. 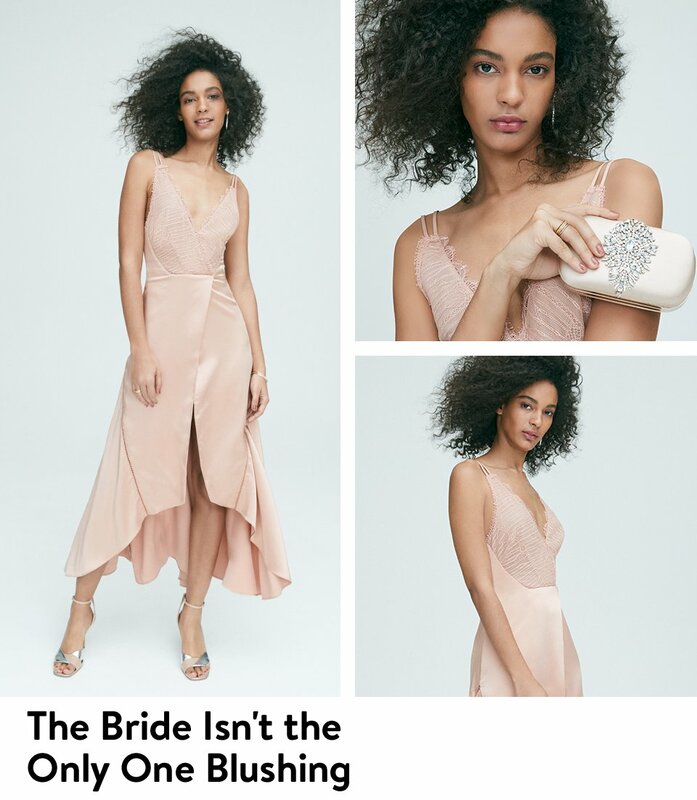 A fluttery chiffon ruffle drapes the one-shoulder bodice to lend softness to the figure-skimming silhouette of a sophisticated stretch crepe gown. A delicately sheer lace overlay topped with luxuriant floral vines is gently draped over a short and sleek slip lining to create a gorgeous mixed-length look. The renowned makeup artist shares her expertly crafted essentials and insider tips.